Why Fitness is More Fun with a Friend! One fool-proof way to keep yourself engaged with your workout is to pair up with someone! Just imagine…it’s 5.30am, it’s dark outside and there’s a light rain pattering against the window. All you want to do is stay lying in your comfortable bed, roll over and go back to sleep. But you’ve promised your friend you’ll join them at that new bootcamp this morning. You can’t let them down, can you? So up you get, get dressed and head out to meet your friend. Now, imagine you didn’t have that friend you were going to meet, how much easier would it have been to just roll over and go back to sleep, just put it off until tomorrow. Tomorrow it’ll be so much easier. And then tomorrow never comes. This is just one reason why your fitness journey is better and more successful with a friend. Here are four more reasons! Having accountability and a social support network are two of the biggest factors that lead to a successful lifestyle change. Knowing you have made a promise to someone else will make you much more likely to follow through and not bail on that bootcamp session. The importance of a social support network can easily be seen if you have ever taken part in one of our Clean & Lean Challenges. The support offered within the Facebook group, at the bootcamps and seminars is second to none. Having people around you who are going through the same experience is a great way to stay on track with whatever task you have set yourself. The support doesn’t stop there. Once you are actually at a class, you now have a partner in crime to sweat with and suffer through anything that our coaches can throw at you. Bring a friend along and see how much harder you can push yourself. Working out together is a great way to strengthen any friendship, and gives you something new to discuss when going for that coffee afterwards. 3. Meet New People and Make New Fitness Friends! Bootcamps are also a great way to make new friends. Get chatting to those sweating around you and before you know it, you might have some great new friends who share similar interests and you can push each other harder each session. Exercise is also so much more fun when you have friends to share the experience with! I know from personal experience that training alongside friends just adds another level of enjoyment to the whole experience and you end up working twice as hard with people around you than you would on your own. Why not bring your significant other along! Research shows that those who train together, really do stay together! Working out together can strengthen your relationship and enhance sexual attraction! If that’s not a good enough reason to get your partner along, I don’t know what is! So what are you waiting for? Grab a friend you think would enjoy our UFIT Bootcamps, drop an email to bootcamps@ufit.com.sg and get them signed up to their first class! We hope to see you and your friends at a session soon! Get fit, get healthy, get outdoors! Experience bootcamps, yoga, boxing, running classes, female only classes, weight training and obstacle race specific training. Introduction offer: 1 month unlimited package for $99. Robynne's passion lies in strength training, conditioning and nutrition. 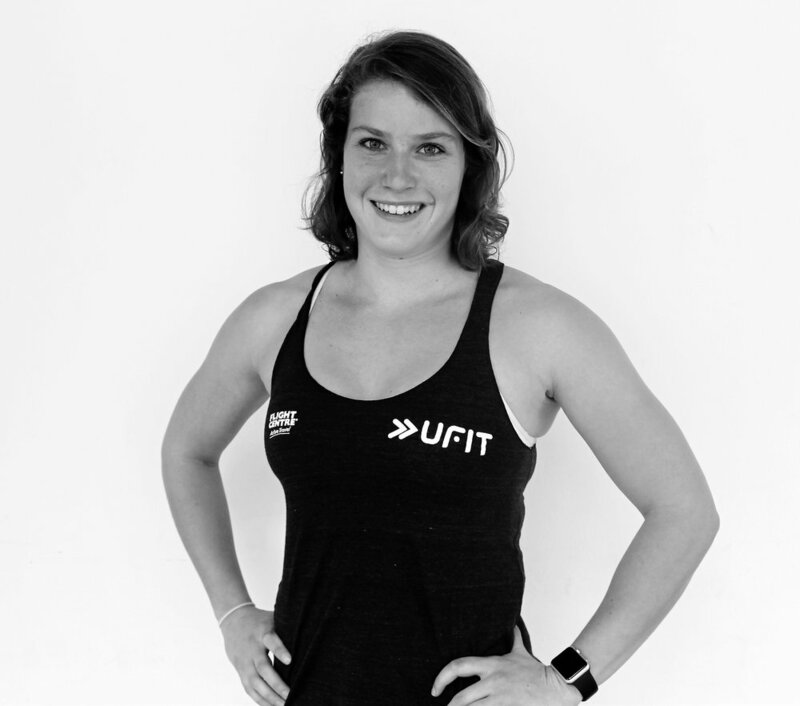 Robynne is a competitive power lifter, currently holding 3 national records in Singapore and aims to build on her own experiences of training when training others.